Part I of this article presented some of the background and construction photos of the Spadina streetcar line which celebrates its 20th birthday on July 27, 2017. In Part II, a look at Spadina in the early months of operation. Much of the northern part of the street has not changed very much over the years, but the south end with its booming condo district is very different and changing still. On Sunday, July 27, 1997, the new 510 Spadina streetcar route replaced the venerable 77 Spadina bus. This conversion was over two decades in the making. Back in 1973, fresh from the political victory of saving the streetcar system from its planned retirement in 1980 [when the Queen subway would open (! )], the Streetcars for Toronto Committee (SFTC) proposed that the Spadina route be converted back to streetcar operation. The Spadina streetcar was abandoned in 1948 with the retirement of the small fleet of double-ended cars serving it (there were no loops, only crossovers at Bloor and south of King), although track between Harbord and Dundas remained in use until 1966 by the Harbord car. Provide the basis for future rapid transit needs between Metro Centre and the Bloor and Spadina subways. Provide more comfortable transit service now with increased interior vehicle space, elimination of lane changing, and reduction of vibration, noise and air pollution within vehicles. Provide a basis for comparing the light rapid transit mode of intermediate capacity rapid transit with a test “guideway” mode being constructed at the Canadian National Exhibition. Release needed buses for suburban service by replacing them with currently surplus streetcars. We were rather optimistic, and hoped that service could be operating by 1974. Of course this assumed that a lot of the existing infrastructure would be recycled, the loop at Bloor would be on the surface, not underground. At the time, there was a proposal for a large commercial development on the Railway Lands known as “Metro Centre”, although it never came to be in the form originally planned. The area is now full of condos (and the Dome), but they came much later. As for “intermediate capacity rapid transit”, the guideway under construction at the CNE grounds never amounted to more than a few foundations for support pillars and the loss of some trees. The development project for what would eventually become the Scarborough RT technology was killed off before the test track could be built. Meanwhile, Queen’s Park had mused about using their technology on streets like Spadina, but were careful to provide illustrations showing the guideway from a distance in front of open space, not the massive infrastructure that would be needed at stations for tracks, platforms and vertical access. There was another problem: the province’s recommended design would have stations no closer than about 1 km apart, a huge difference from the bus service with many local stops. The idea received approval in principle, but quickly ran aground for various reasons including the unsuitability of Clarence Square for the south end loop (SFTC had proposed looping at Adelaide via Charlotte and King with buses continuing to serve the then-industrial port area). The TTC wanted the streetcars to match the existing bus route which looped around the square. At the north end, a surface loop was not practical because of land constraints. 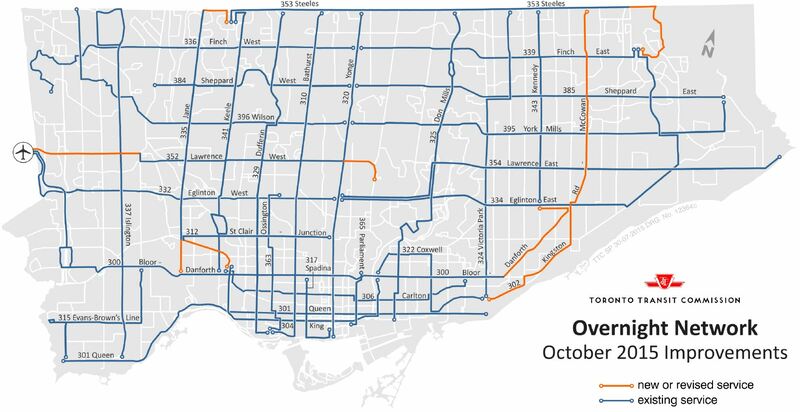 Thanks to the TTC’s presentation of the streetcar as a rapid transit line to the pending development south of King, there were fewer stops on their proposed route than were eventually built. (For the record, the SFTC proposal included all of the stops that were in the final version.) Combined with a curbed right-of-way, this was seen as a move creating a “Berlin Wall” down the middle of the street. As a result the original design had no curbs in some locations leading to many collisions with errant motorists, and the curbs appeared as a retrofit. Today, ironically, the streetcar right-of-way acts as a refuge for jaywalking across Spadina, a dubious and dangerous practice before the streetcar’s return. This article is a photo gallery of the line’s construction. In a second installment, I will present a gallery of the line in operation. In these photos, what is so striking is how little many parts of Spadina have changed and the low-rise street character is much the same today as it was in the 1990s, although change is spreading north from the condo district at King. For more on the history of streetcars on Spadina, see Transit Toronto. On January 3, 2016, the schedule for route 510 Spadina changed from one based on the use of standard-sized streetcars (the CLRVs) to the new longer low-floor cars (Flexitys or LFLRVs). This article reviews the operation of the line before and after the new schedule. The revised service provided an increase in capacity with a replacement ratio of new cars for old on a ratio considerably lower than 2:1, and during periods of infrequent service (early weekend mornings, late evenings), the replacement was 1:1. In brief, the service actually operated on 510 Spadina bears little resemblance to the advertised schedule. Headways (the time between cars) are erratic and often wider than the scheduled values for both the “old” and “new” service designs. The proportion of service operated to the three destinations (King, Queens Quay and Union Station) do not always match the schedule, and indeed during January (when only two destinations are supposed to be in use at any time), service to all three persists just as in December. However, padding the schedule, a tactic used on other routes to eliminate the need for short turns, is impractical here because terminal congestion with queued vehicles would severely interfere both with passenger travel times and with terminal operations. Unlike a route such as 501 Queen where most riders depart from vehicles before the terminal, 510 Spadina has very strong demand to its destinations at subway stations. Line management consists of dispatching cars and operators as available, and the service levels on each branch do not match the actual design, notably the proportion of service that should operate on each section of the route. 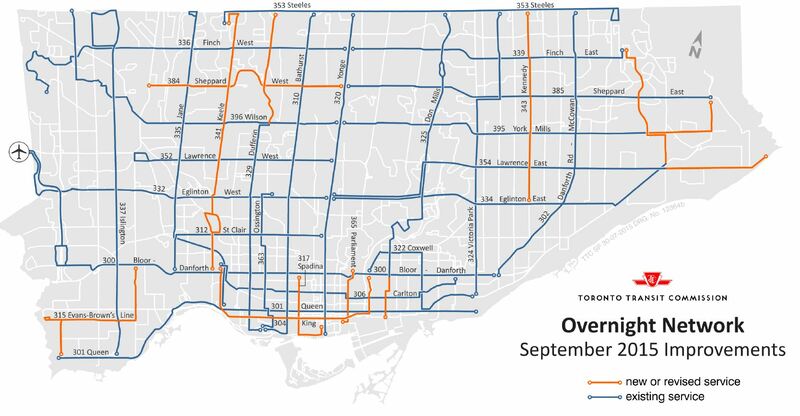 This particularly affects riders south of King and on Queens Quay whose service is erratic and below the advertised level even though the area has a large and growing population. The TTC will be rebuilding the track at the intersections of King & Charlotte and Adelaide & Charlotte beginning on March 29. Charlotte Street forms the eastern part of the loop used by 510 Spadina cars at King Street. 504 King streetcars will divert eastbound via Spadina, Queen and Church, while westbound service will divert via York, Queen and Spadina. 510 Spadina streetcars will all operate at least to Queens Quay loop. A 504 shuttle bus service will operate between Strachan and Church diverting around the construction via Richmond westbound and Front eastbound. For the period from April 11 to 26 while Adelaide & Charlotte is under construction services will operate on their normal routes, although 510 Spadina cars will continue to operate to Queens Quay rather than turning at Adelaide. The overnight “Blue Night” network will see many changes and additions this fall. These will be rolled out in two waves: first with the September/October schedules on Labour Day weekend, and the remainder with the October/November schedules at Thanksgiving. This is part of a more extensive expansion of service beginning in September that relates to the Ten Minute Network, All Day Every Day service, and improved crowding standards on routes with frequent service. Those and other changes will be described in a separate article. Several of the routes will be renumbered so that the night services match the daytime routes except for the using “300” series. In the case of the King and Spadina night services, they will run, at least initially, with the daytime route numbers because there are no roll signs for “304 King” or “317 Spadina” in the CLRV/ALRV fleet. This problem will vanish as the routes convert to Flexity cars with programmable signs. All services will operate on 30 minute headways. This implementation is a work-in-progress, and Service Planning does not expect to turn to the question of timing points until the routes are in place. 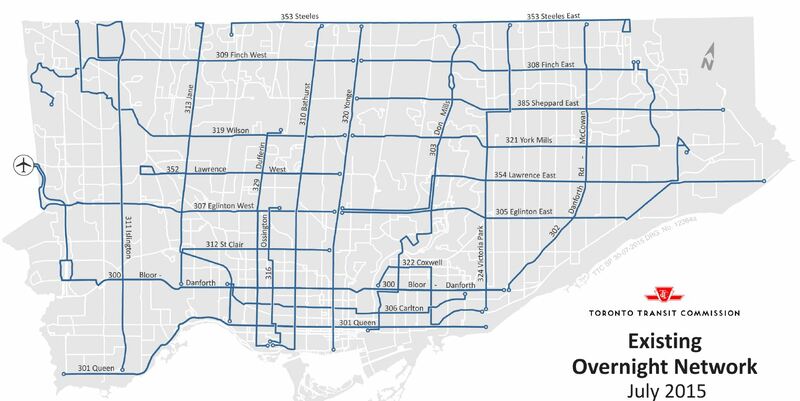 This is a vital piece of work for a network with wide headways where TTC performance stats show that headway (and, by implication, schedule) adherence is very weak. Riders of these routes should be able to depend on vehicles appearing at expected times and connections to work in a predictable way. This is as important a part of the new service as simply putting the buses and streetcars on the road. If service is not predictable in the middle of the night, riders cannot be expected to use it especially for trips that are time-sensitive such as early morning work shifts. Updated May 8, 2015: The TTC has posted a time-lapse video of the reconstruction for those who want to see the whole thing in two minutes. On Monday, April 6, 2015, the TTC began reconstruction of the intersection at College & Spadina. The work is planned for a three-week interval, and as of April 10 the project is moving along swiftly. During this work, 510 Spadina buses and 506 Carlton cars are diverting around the site. Resumption of through service is planned for Monday, April 27. As with all such jobs, the work began with demolition of the existing intersection followed by the pour of a new concrete foundation on which the new track will sit. The track was pre-assembled at Hillcrest Yard and then broken apart into panels which have been delivered to the site on many trailers spotted around the intersection. The TTC’s Brad Ross posted an excellent photo on Twitter of the fully assembled intersection. Reassembly begins with the diamond in the middle of the structure, and works outward to each arm of the intersection. My thanks to Harold McMann for the photos of early stages in this work. April 10: Track panel sits on College west of St. George. April 10: A track panel lifted off of its trailer. Updated April 12, 2015 at 1:40 pm: New gallery added. Assembly of the intersection began on Friday morning, and two days later, it is nearing completion with only the south quadrant still missing. At the end of the gallery below, the track panel that will be the southbound section of the south quadrant is being reading for its move into position. April 12: Welding the S to W curve. Updated April 18, 2015 at 1:10 pm: New galleries added. Tuesday, April 14: Assembly of the approaches to the intersection is well underway. Saturday, April 18: Concrete work around the tracks is substantially complete, and some pedestrian paths through the intersection have been shifted onto the pavement to allow work to begin on sidewalk and curb repairs.